A few weeks ago I had a really good sweet spaghetti squash that was smothered in butter, cinnamon, and raisins. After that I really wanted to try making it at home. 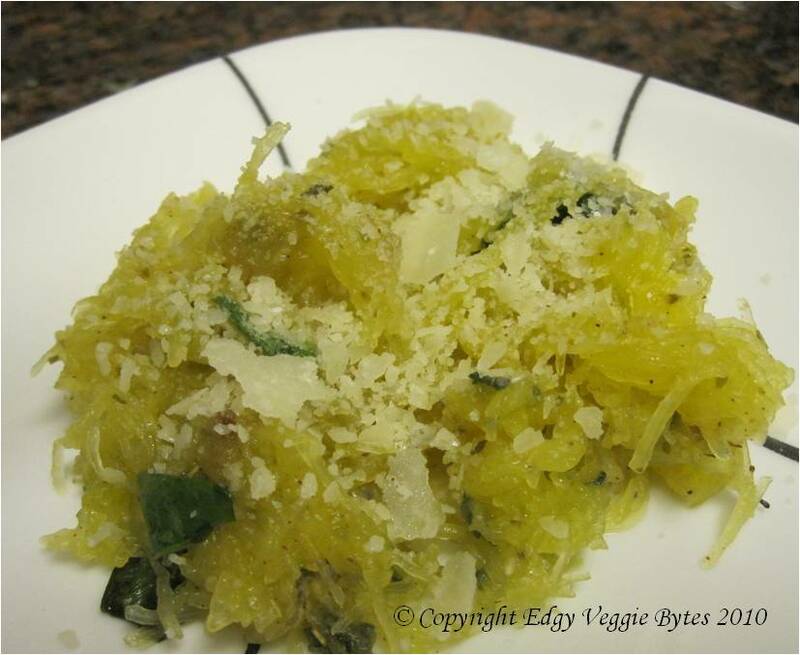 I was having acorn squash soup for dinner one day, so I wanted to try making a savory spaghetti squash dish. This was my first time cooking spaghetti squash and although it does take a while to bake, it is fairly easy after that. 1. Cut spaghetti squash in half and wrap in foil. Bake at 375 F for 45 mins. 2. Unwrap from foil (be careful, it will be hot). Using a fork, gently scrape the squash out (you should be able to get fairly close to the skin) and put in serving bowl. When you scrape it out, it looks like spaghetti (I assume this is where the name comes from). 3. Add the remaining ingredients and gently mix in. 4. Serve hot with Parmesan (optional).